If you constantly compare yourself to others, you’re at the wrong party. Truth: Your party is strictly about you, and begins and ends with you. I know this, and yet time and again, I catch myself chasing after someone else’s success and happiness, and wishing it was mine. Yes, I’m multi-published author. I worked hard to attain this dream and I love sharing my stories with others. Readers often email to let me know how much they enjoy my books. As wonderful as I feel when I hear from fans, I still catch myself in the ugly trap of comparing myself to others. I’m not as good as this writer, or as successful as that one. This is not good for my self-confidence or my happiness, and certainly does nothing to improve my writing. This makes perfect sense. 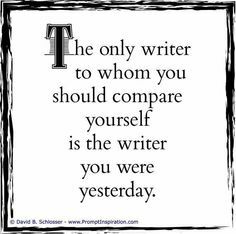 Because, let’s face it, the only writing skills and output that I can control is my own, and the only person I can control is myself. The same goes for you. Of course, I can learn a great deal by reading a particular author and noting how s/he crafted their masterpiece. I can learn new ways of promoting myself from others’ successes. I’d be crazy not to do these things. But ultimately, my party is inside of me. Just as yours is inside you. This entry was posted in Motivational Monday, musings and tagged ann roth, compare, enjoy, fans, happiness, masterpiece, mearsure, novel, output, promoting, success, writing. Bookmark the permalink.